Home AP JOBs JOBS Railway Recruitment Board Recruitment RRB TS JOBs RRB Sub Inspectors Recruitment, Online application form, How to Apply? RRB Sub Inspectors Recruitment, Online application form, How to Apply? 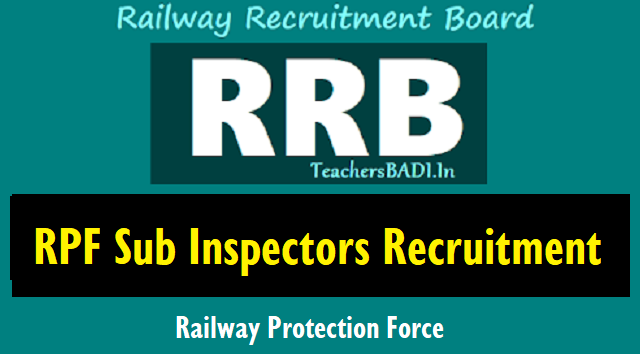 RRB Sub Inspectors Recruitment, Online application form, How to Apply?. RRB Recruitment of Sub Inspectors in Railway Protection Force(RPF) - RRB RPF Sub Inspectors Recruitment 2018,Online application form, How to Apply? : Railway Recruitment Board Sub Inspectors(SI) Recruitment 2018, RRB Sub Inspectors Recruitment, RPF Sub Inspectors Recruitment, Railway Protection Force Sub Inspectors Recruitment, RRB Railway Recruitment Board Sub Inspectors Recruitment 2018, RPF Railway Protection Force Sub Inspectors Recruitment. The Railway Recruitment Board (RRB) has invited online applications (Employment Notice number SI/RPF 02/2018) from eligible male and female candidates for recruitment of Sub Inspectors in Railway Protection Force (RPF) of various zones of Indian Railway and Railway Protection special Force in level 3 of 7th Central Pay Commission (CPC) pay matrix. The application process begins on June 01 at 10am and will close on June 30, 2018. The total number of vacancies to be filled through this recruitment process is 1120. The candidates should ensure that they fulfill eligibility conditions before applying. The candidates should be between 20-25 years of age on July 1, 2018. Only candidates who have a SSLC/matric degree from a recognised board are eligible for Sub Inspector post. The online computer based exam will be held tentatively in September and October. The selected candidates will be offered Rs 35,400 per month as salary plus allowances. Note: The detailed advertisement can be seen in employment news dated May 19-25. Online applications are invited from eligible Male and Female candidates for the recruitment of Sub-Inspectors (SI) for the vacancies in Railway Protection Force (RPF) of various Zones of Indian Railways and Railway Protection Special Force (RPSF). Age limit: 20 to 25 years as on 01.7.2018. Scale of Pay: Rs.35,400 plus other allowances admissible at that time. Based on Computer Based Test (CBT), Physical Efficiency Test (PET) & Physical Measurement Test (PMT) and Document Verification (DV). Date of opening of online registration: 01.06.2018. Date of closing of online registration: 30.06.2018. RRB RPF Constables Recruitment 2018, Online application form, How to Apply?